This pin caught my eye because I have the exact Thirty-One Little Carry All that the blogger, Jen, used for her kit in Breastfeeding: Take 2. Mine was a Christmas gift from my mother-in-law, and I had not yet found a use for it. So this was the perfect idea! Obviously I may or may not end up using this kit, but it's worth a try. I copied Jen's contents almost exactly since I don't yet have any personal experience to know what I'll want/need in mine. 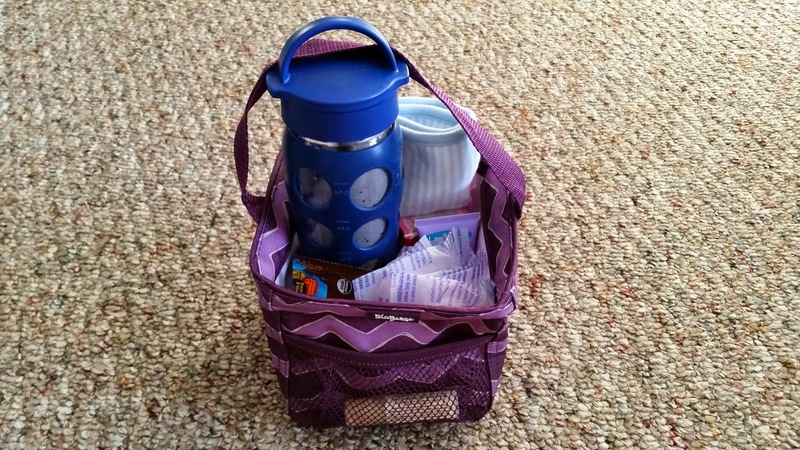 I removed a few items (water bottle, snacks) after I assembled the kit since I won't be using it immediately, but they will be easy enough to add back in once the baby arrives. Do you have any suggestions for items I might want to include in this kit? Sweet idea. When I was nursing, I found lanolin helpful. When you're actually nursing, a paperback book might be nice, too? If you're home along and baby is dozing and yr'not.